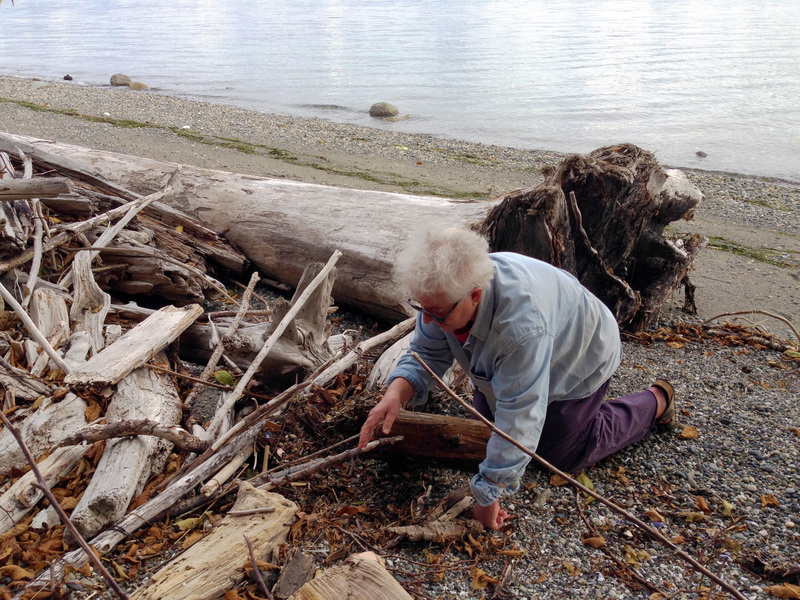 As Pat Collier trudged along the gravel beach near her Maury Island home, she paused to consider the row upon row of bleached-out driftwood logs, all new arrivals over the past nine years. The logs had washed up in 2014 and 2015 after a large wooden retaining wall known as a bulkhead had been removed from her beach property. Bulkheads and other so-called shoreline armoring meant to stave off erosion have been a common sight along Puget Sound’s beaches for much of the past 100 years. Now, more and more residents like Collier are opting to take them out and let nature take over. The change to Collier’s beach was swift. The new logs and tons of smaller woody debris now support a multitude of tiny invertebrates, she said, demonstrating by flipping over chunks of wood half-buried in the gravel. All these little creatures play key roles in an intricate food web, one thing feeding another, giving life to fish, birds and even killer whales. Collier, 79, a retired schoolteacher, had the bulkhead taken off her property in 2006, and she has never regretted the move. She has watched her beach transform itself from a narrow band of coarse gravel adjacent to a vertical wall into a more pleasing natural setting. Collier lives near Point Robinson, the northeastern corner of Maury Island, across a five-mile expanse of water from Federal Way. 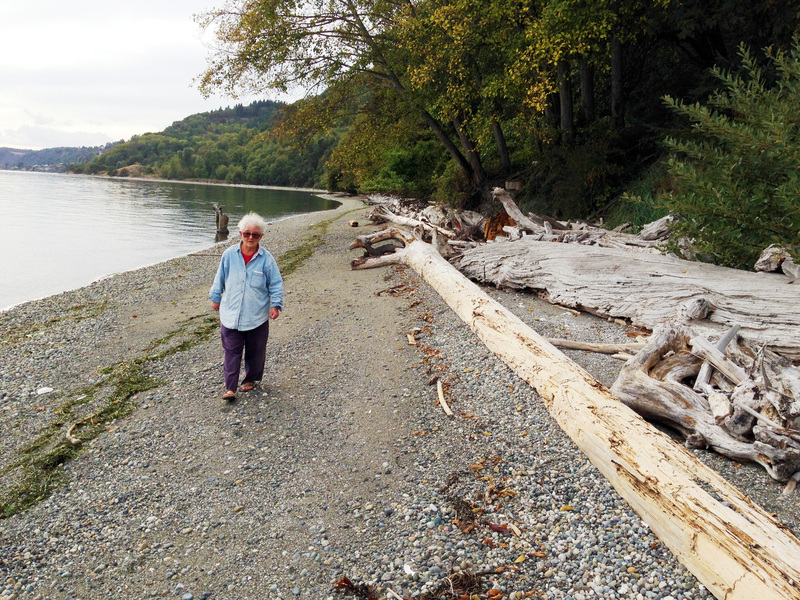 Exposed as it is, her property gets pounded by some fierce waves in winter, so she lost far more land to erosion after bulkhead removal than property owners in low-energy locations. Collier is among a growing number of waterfront property owners volunteering to rip out bulkheads and other types of shoreline armoring for the good of Puget Sound. Officials involved in Puget Sound restoration say such efforts need to increase to compensate for the general decline in shoreline habitat. Every waterfront site is unique, but experts say they are surprised at the number of bulkheads they find on Puget Sound beaches where erosion is slow and the structure serves little or no purpose. The Puget Sound Partnership, which helps to coordinate the restoration of Puget Sound, has concluded that improving shoreline habitat is vital to restoring the overall ecosystem. Reducing construction of new bulkheads while removing old ones has become an established goal, supported by numerous agencies and organizations. Supported in part by a cooperative agreement with the Environmental Protection Agency, Washington Department of Fish and Wildlife has taken a lead role in the shoreline-restoration effort. The agency has provided numerous grants to entities across Puget Sound to study the effects of bulkheads, address permitting problems and help waterfront property owners determine whether bulkhead-removal may be right for them. 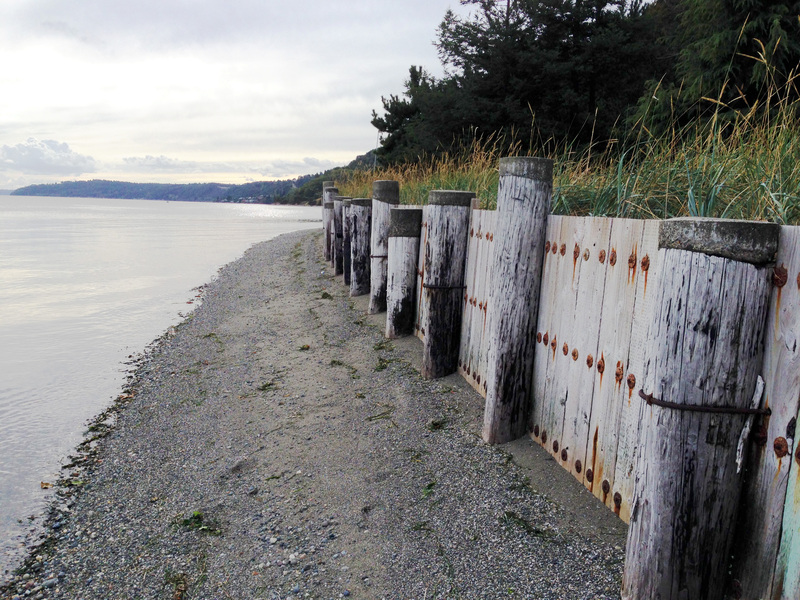 Waterfront property owners are playing a central role in shoreline restoration, and more people are needed to join the effort, said Maria Hunter, grant program specialist at WDFW. About 57 percent of Puget Sound’s total shoreline is considered residential. And of those residential parcels, 48 percent contain shoreline armor. “We need to know what will bring people to the table,” Hunter said. Surveys have shown that people who live on Puget Sound really do care about the environment, she said. Officials believe this notion of stewardship should make local residents willing partners in restoration, and agencies like WDFW and Ecology are working to provide waterfront owners with the best scientific information about shorelines — not just general information but specific details about their individual properties. Some sites, such as those where a house is built close to the high-tide line, may not be suitable for bulkhead removal. But in some cases, a bulkhead can be removed with erosion protection provided by anchoring large logs or rocks into the beach to reduce the force of the waves — so-called “soft-shore” protection. Sometimes beach material can be brought in to gently slope the shoreline and dissipate wave energy. Often, bulkheads are not necessary to protect a home or other structures from erosion, but there are subtleties at each site. “We want to encourage people to talk to professionals and make up their own minds about what they want to do,” Hunter said. The Department of Fish and Wildlife, in coordination with others, has launched a new website designed to be a “one-stop resource” about shorelines. Under the banner “Shore Friendly,” the site will help waterfront property owners find information, connect with experts and identify potential funding sources. A new booklet, “Your Marine Waterfront: A guide to protection your property while promoting health shorelines”, is also available through the website. Shore Friendly is a public information website for waterfront homeowners who care about the health of Puget Sound.